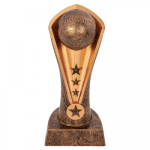 Cobra Resin Awards come in a variety of activities and are a great value. Each piece is 7.5" tall. FREE ENGRAVING personalizes each item.